1. Many are used for storage and office space or fan plants or mechanical rooms. 2. Some entrances have the street stairway missing. 3. Some entrances are slabbed over at street level and/or tiled over at the platform level. Rebuilding missing stairways, moving offices and mechanical rooms, replacing lighting, and removing slabbed over entries and tiled over entries cost money and would require competitive bidding. 2.keep the gate wide open. Could you shoot me an email at firstname[dot]lastname[at]gmail[dot]com? So the MTA can’t find a few thousand dollars for new faregates, but it can find billions of dollars to throw away on station renovations that look pretty but provide absolutely no benefit to passengers? People will simply not ride a subway that looks like it’s a post-apocalyptic wasteland. Making stations look good makes them look safer, which in turn increases actual safety (broken windows theory), which benefits passengers. 67th Ave. (M/R) looks absolutely fine, isn’t a transfer point, and doesn’t need a renovation. It’s a waste of money. The money should expand service eastward, so the real long term revenue drain, buses, aren’t relied upon as heavily in all of Queens, east of Flushing, Kew Gardens, and 179th Street. The per rider operating cost of the buses here is absurd. I don’t see it. The main problem the MTA faces right now is crippling overcrowding because of insatiable demand. One crisis the MTA is not facing right now is “people don’t want to ride the subway because some of the stations are gross.” My station is gross, and I don’t really care because I still need to go to work. Even if I had another station nearby that was immaculate but added a minute to my commute, or decreased my chances of getting a seat on a train by 1%, I would stick with my crumbling bomb shelter. Last week there was yellow caution tape blocking off an area in Union Square where it looked like the many years of old, thick peeling paint were falling off the ceiling. This was right in the middle of the area where you walk to get from the NQR to the SE exit, delaying the massive crowds trying to transfer or exit. The stupid “gap fillers” on the 4/5/6 at Union Square often cause serious delays. Even when they don’t cause extremely long delays themselves, a 1 minute issue there makes it hard to keep to schedule, causing further crowding up the line. J service has also recently been disrupted by “falling debris” at Chambers Street. The stations are in such bad shape that it does impact the actual use of the station. It’s not just aesthetics. Also, the idea that allowing stations to become disgusting is okay because demand to ride is high is not a helpful way to look at transit access in the city, and nobody would accept that view for other public facilities. Our oft-derided “3rd world” LGA airport for instance, is at least regularly cleaned. Are people saying “who cares, just run more flights”? No, we’re spending billions to make LGA look even prettier, because World Class Cities (R) have sparkling airports to attract wealthy tourists and business travelers, but peon commuters should have to dodge rats on the platform and accumulated steel dust on the walls. Have you been on NYC subway in the past 50 years? It already looks like a post-apocalyptic wasteland. It’s ridiculous and embarrassing. And yet most people keep on riding it. I go out of my way to ride post-apocalyptic wasteland subways. The looming L Train shutdown isn’t the only closure that will necessitate re-opening closed entrances in Bed-Stuy, Bushwick and Williamsburg. MTA will be conducting flood mitigation work at five stations in CB1 later on this year. As part of the project, each affected station will have all of its entrances closed for three months — although they won’t be closed all at once. Four of these stations have a total of 14 closed staircases: Broadway G (6), Flushing Av G (2), Lorimer St L (2) and Metropolitan Av G (4). But, wait, there’s more. As y’all know, MTA announced that they’ll be closing 30 stations for significant periods of time for station upgrades. Four of those closures — the Flushing Av G, Classon Av G, Clinton-Washington Avs C and Kingston-Throop Avs C stations — will result in riders being forced to use stations with shuttered entrances. Those stations are the Myrtle-Willoughby Avs G, Bedford-Nostrand Avs G, Franklin Av-Fulton St A/C/S and Nostrand Av A/C. For the record, some members of the L Train Coalition have been calling for re-opening closed entrances at the onset — the executive director of the Grand Street BID, some business owners and myself. It just has not received coverage until now for whatever reason. Anyways, Ben, I appreciate your continued coverage of this issue! I don’t understand this ADA business. Is the MTA’s need to comply with the ADA triggered by re-opening a closed entrance to an already existing subway station? That would seem to have predictably perverse effects. OK, I know the ADA rules pretty well now. If it’s just a matter of unlocking a door, it’s not a “renovation” and the MTA can just do it. If the work necessary is really cheap, so that 20% of the funding wouldn’t be anywhere near enough to make a wheelchair-accessible entrance anywhere, the MTA can do it — they probably still have to put up handrails and yellow caution strips and do other ADA things. If the main entrance to the subway station is already wheelchair-accessible, nobody is going to bother them for opening a secondary staircase entrance. If the subway station is entirely non-accessible, and the MTA spends tens of millions or more on opening up a hole in the sidewalk (where the old entrance was paved over), building a new set of fencing and awning over the entrance, retiling the walls, etc. etc. etc., then they *are* going to get in trouble for not making the station accessible first. The ADA line doesn’t appear to hold water given what MTA is doing at the Grand Street L station. As I understand it, simply opening a closed entrance doesn’t trigger ADA compliance since the station it self is not being altered in a “substantial way.” The MTA is running scared do to past ADA violations. If they do nothing, maybe the heat from the feds will be turned down a bit. My comment was in reference to the work they are doing at that station, which entails rebuilding all four staircases. This, based on my understanding of case law, would qualify as making a significant “alteration” to the station. Yet these upgrades don’t include making the station ADA accessible. Someone correct me if I’m mistaken. As I recall – Only areas that are being substantially renovated fall under ADA requirements. That’s why I question your above statement. However you maybe right & I maybe missing something in translation. The info I’m drawing from comes from 1990 MTA docs that were passed out at hearings plus EPVA audio docs on ADA regulations. IIRC (it’s been awhile since I’ve sat down with the ADA in full text), it’s not just whether a renovation constitutes a significant alteration, there is also a cost element that needs to be triggered. The project needs to be large enough that the cost of accessibility improvements do not significantly increase the total project cost (I think the threshold is 20% of planned project costs) for an agency to be required to make accessibility improvements. I could have misinterpreted this passage, and it’s unclear whether reopening a station entrance triggers a separate part of the law. Correct. I remembered that as well, but neglected to post it do to length. One more caveat: Segmenting the project into separate projects in order to evade the ADA requirements is not permitted. So if 20% of the *entire* project cost would get you an accessible entrance, you can’t break it up into 5 sub-projects and then claim that 20% of each of them wouldn’t get you an accessible entrance. Neither the cost nor the scope of the rehabilitation of Fourth Avenue forced the MTA to include ADA-compliant access, and that rehabilitation included the reopening of the long-closed entrances on the east side of Fourth Avenue. ADA does allow for waivers for historic structures or structures which can not support full ADA. In the case of MTA, a waiver was granted for Union Square on the 4/5/6 due to the curved platform . Adding elevators would esquire opening the street to straighten the tracks to allow removal of the curve.A waiver was also granted for Smith and 9th for elevators, but all other ADA requirements had to be met including equal height stair treads, ADA compliant handrails, etc. I am a retired Station Agent for NYCT and we were given basic training in ADA but not a full detailed analysis of ADA. Smith & 9th should never have been given the elevator waiver. It was straightforward to design a new groud-level headhouse east of the river with direct elevator access and would have been a hell of a lot cheaper to build than the current arrangement. Nobody bothered to sue over that one but they should have. So all we have to wait for is the MTA to be so flush with cash that it can afford ADA access at all it’s stations, have selected and deployed a Metrocard replacement, and finds the institutional will to accede to such requests. I think it’s probable that star trek style transporters will render subways obsolete before that happens. 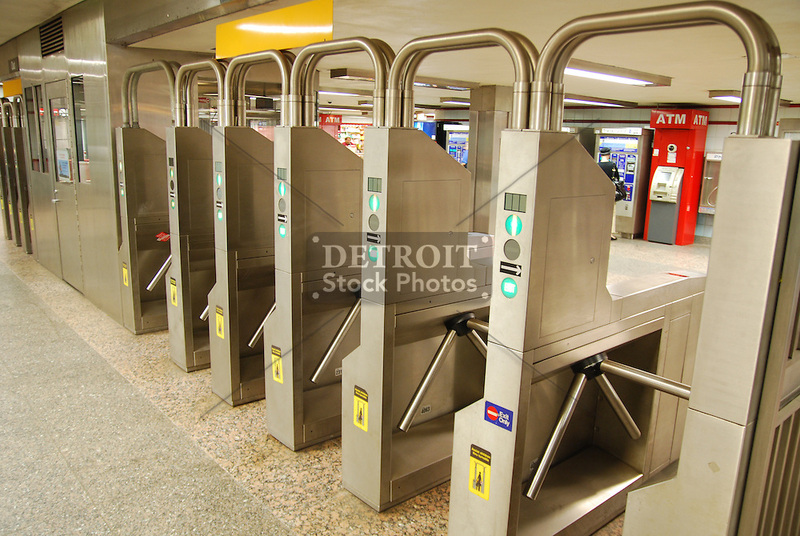 Could fare gates from the least used stations, say one or two each, be transfered to the re-opened entrances ? This would keep capital costs down, have minimal impact on the raided stns., and could be done relatively quickly. Or is this too simple a solution ? Yes! There are hundreds of stations in our huge system. Surely there are a handful of stations that have seen a decline in ridership, that could spare a turnstile or two. Alternately, why not re-open the stairways, but make them exit-only? That’s not ideal, but it solves half the problem, at least. Then when we have the new fare system and new turnstiles in a few years, those stairways would graduate to full entrances. two yellow grates emblazoned with the words “Subway Keep Clear.” On the corner of Grand Street and Union Avenue, there’s another metallic grate with the same words. These sounds like emergency exits, not closed former public entrances. I’m not familiar with the station, so is that the case, or are they actually closed entrances? If they’re just emergency exits – built originally as emergency exits – then they can’t just be “opened”. There might just be a steep set of emergency stairs – a ladder, really – instead of normal stairs. There wouldn’t even be room for real stairs without ripping out everything and enlarging the space. The passageways to the stairs might not lead to the platform at all. They might also be narrow passages with low ceilings, with no room for turnstiles. They would need to be re-built almost completely. That’s a wildly different prospect from simply re-opening a closed entrance. Per MTA, there are two closed entrances and four closed staircases at this station. Deuce Bigalow European Gigalo, and Four Brothers are both movies from 2005. Does this mean the entrance was closed circa 2005? I thought many of these entrances were closed during the “bad old days” due to concerns over crime. 2005 strikes me as at least a couple years after this era. What gives? Yes, a lot of the station exits were not closed in the “bad old days” because of low ridership and crime, but rather they closed because the MTA simply decided they’d rather not bother with cleaning and maintaining the exits for public use and/or they wanted more space for storage of equipment, MTA police, etc. Riders’ convenience is not their priority. There was argument during the passage of the ADA over whether everyone should be required to comply immediately. The compromise made in most places was that compliance would only be required for upgrades. Poor Amtrak *was* required to make *all* stations accessible (and with much much less funding than the MTA, has not managed to do so). Closing an entrance is a downgrade. Opening one is an upgrade. Nobody expected the MTA to be so deliberately noncompliant with the ADA. Every other agency in the country is doing very well at complying with the ADA. Watch out; MTA’s scofflaw attitude may cause the law to be changed to require NYC to make more stations accessible. The closures have occurred in recent times as well. The much-discussed Metropolitan Avenue (G) Grand Street-side closure happened along with the station renovation ca. 1999/2000. I believe Broadway (G) has had one of its exits closed for only a few years now (with temporary walls). It is a common practice to reclaim some mezzanine space when stations are renovated.A recent example is Jay Street A/C/F and Queens Plaza. Both stations have d the space converted to office,storage, mechanical, and employee space. I dont buy the faregate issue. PATH is adding new gates at Harrison, and those gates take Metrocards. MTA can buy those as well. The plastic “dip” faregates PATH and airtrain use would all be vandalized and broken within days if used in NYCT. because new york is special, right? Yes, please tell me about how kids in Newark and Jersey City are so much more well-behaved than NYC kids. The idea that PATH ridership is somehow above vandalizing where NYC residents are uniquely animal is totally ridiculous. Right? But let’s go further: why doesn’t the MTA literally use the exact same faregates so we can use the PATH SmartLink card on the NYC subway? We could have RFID payment technology implemented so quickly. Don’t reinvent the wheel here. Don’t forget to thank your federal government, legislators, and regulators for their part in screwing the public. Tell Schumer, et al to change the stupid [if well intentioned] ada law to something REASONABLE. And I would wager, as other commenters have noted, that the mta could rustle up a few turnstiles that could be spared from some lightly used stations. But that would take some thought. The federal government will probably be happy to change the ADA law to require that NYCT make ALL stations wheelchair-accessible IMMEDIATELY. The current law WAS the reasonable compromise. Every transit agency in the country outside NYC has found it perfectly straightforward to comply with it. What’s wrong with NYC? Chicago is the only other city that used Metrocard http://cdn.c.photoshelter.com/.....otos51.jpg . They like their turnstyles and wont give them to NYC. As has been pointed out before in this blog (the Q70 fare proposal comes to mind), MTA and NYCT suffer heavily from Not Invented Here syndrome when evaluating outside ideas. Mta should reopen the long closed Bowery western exit. The station has grown and theres tons of development in the bowery. When did this happen? I assume this was post-ADA? What changed that this isn’t possible anymore? It just slipped under the radar and the MTA is scared to do this again? It looks like that was written in 2008. Why was this entrance allowed to be reopened in 2008 or so, but they can’t reopen entrances today? ADA changed since then? This happened. Since then, NYCT has stopped re-opening new entrances. The A/C line report explained this as well (See the last two paragraphs on that linked page). If resurfacing a road triggers ADA then the MTA triggers ADA on a weekly basis. Every other city in the country is having NO PROBLEM complying. Even Philadelphia. NYC has been uniquely bigoted against the handicapped. SEPTA has now actually installed those elevators at the 15th Street station. And it’s a great improvement. SEPTA’s showing a decent, cooperative attitude now.